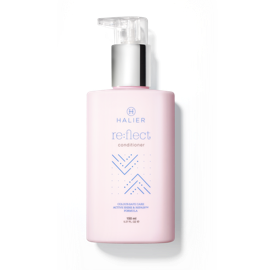 Re:flect collection consists of the shampoo and the conditioner. It is dedicated for those who have had their hair dyed. Thanks to those cosmetics, hair colour lasts longer after dyeing, strands are hydrated, smooth and properly nourished. Forget about frequent visits to your hairdresser's to colour your roots and refresh your ends. Prevent epidermal water-loss, add shine to your hair, protect it from frizz and make detangling easy. Re:flect Shampoo and Conditioner is a perfect solution for those who dye hair regularly, making their structure weakened. by colouring and weak strands. Active Shine & Repair™ Formula restores shine and healthy look to strands. Thanks to the products, hair is hydrated, soft, healthy, and the colour is bold for longer. The active ingredients prevent epidermal water loss, add shine to strands, protect them from frizz and facilitate combing. Halier products are dermatologically tested and free from SLS (Sodium Lauryl Sulfate), SLES (Sodium Laureth Sulfate) and SCS (Sodium Coco Sulfate) - i.e. substances which may cause irritation. The shampoo which brings back the shine and healthy look to colour-treated hair and rebuilds their structure damaged during dyeing. It also washes and hydrates strands. The product has been dermatologically tested. It does not contain SLS, SLES, and SCS. The conditioner which rebuilds the structure of hair damaged during dyeing, restores shine and softness, and helps seal bold colour for longer. The product has been dermatologically tested. It is free from sulphurs, silicones, and parabens.